We really enjoyed our stay at Boa Guesthouse. The bed is comfortable and the room is clea. There is enough space to do our prayers. There is a prayer room on the rooftop too! There is a kitchen with fridge & microwave. Also, the utensils are segregated halal & non-halal. The lady at the reception is extremely helpful and will help with directions. Location is near subway station. And nearby plenty coffeeshop & and grocery store. :) We will definitely comeback for our next stay and recommended. I loved staying here! It was in a great location and I felt very safe! Fantastic hostel in a fantastic location! The staff a fantastic and are always willing to help. I originally booked a dorm room but was upgraded to my own room. Such a fantastic place. Got a private ensuite twin room. The bathroom's in the middle between the beds which gives a little privacy, however the entrance is in front of one of the beds which is a little awkward. Overall the place is very clean and the staff is nice. Breakfast included cook-your-own eggs which was great! Location is amazing right in Hongdae. Not really a common area to meet people, but that's ok. Very respectful of halal needs as well! Excellent location, right next to Hongik university and lots of nice places to eat and go out. The closest metro is really well connected too (very easy for the airport). Really lovely staff, we had to get a new debit card delivered and they were very helpful. Nice kitchen and roof top area as well. Only thing we found was we hardly saw anyone else about, I wouldn’t stay here if I was on my own wanting to meet others! 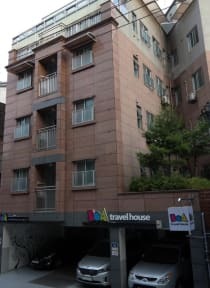 BoA Travelhouse is the best place to stay in Seoul. This was my second time staying there and it was even better than the first. Good rooms, comfy beds, perfect location, free wifi and a kitchen all make this place a home away from home. They were doing some renovations while we were there but we couldn't hear them. The staff are wonderful. I had trouble with my aircon, which I should have said something about (sorry!) but they made my birthday a wonderful one. Thank you so much, BoA and staff!